YUM! YUM! YUM! I am still trying to use up all that tart and delicious in season rhubarb here in rainy Seattle, and after exhausting a huge majority of strawberry rhubarb combos, I decided to go with tropical fruit. June weather is just plain depressing around here, since we don't really see temperatures above 65 until after July 4th, so pineapple is the perfect tropical treat to lift our impatient spirits. In the midst of boiling down the rhubarb, I realized that I was OUT of sugar. Unheard of with tart rhubarb dessertness, so I opted for some honey to improvise. Man, it ended up sooooooo delightful. First, chop about 2 stalks of rhubarb into one inch pieces and put in a medium saucepan. Add about 1/4 cup of water. Boil this over medium heat until it gets pretty chunky and starts to soften. Add about a cup of finely diced fresh pineapple. Boil until the rhubarb is super soft, and blend together using an immersion blender. You can use a regular blender here too, but if you don't have an immersion blender GO buy one. They are SO amazing. Stir in 3 Tablespoons of honey, until the honey is completely melted. Add about a 1 and 1/2 cups of water and a pinch of salt. Let cool completely. Add the lids (or popsicle sticks) and freeze overnight. Popsicles are such a great way to use up extra fruit from produce bins, or enjoy a healthy and unprocessed at home treat! I actually had a ton of leftover juicy goodness, so I added the rest to some ice trays for some popsicle ice cubes (utilized later with a boozy cocktail recipe I'll be sharing soon). 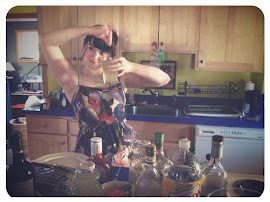 Check out my recipe for pineapple rhubarb caribbean rum. This is great! We have some rhubarb to use! This site is only a few days old so it's really wonderful to hear some feedback. Thanks for popping by my blog! I've had a blog for a while but only in the last 8 months have I actually been taking it seriously so we can be newbes together, yeah? Those pops look delicious. I love real fruit ones (have you tried Edys coconut bars? To die for) Anyways, I was also pondering the little straw thingies. Maybe the are so you can slurp up the yummy melted juice? Hi Shakti! Those straw things ARE for that, but they didn't seem to work. :( Maybe cheap cheap popsicle makers aren't the way to go. haha! Anyways........ always down for newbie blogger companions. Look forward to following you!